For other people named John Hume, see John Hume (disambiguation). John Hume, KCSG (born 18 January 1937) is an Irish former politician from Derry, Northern Ireland. He was a founding member of the Social Democratic and Labour Party, and was co-recipient of the 1998 Nobel Peace Prize, with David Trimble. He was the second leader of the Social Democratic and Labour Party (SDLP), a position he held from 1979 until 2001. He has served as a Member of the European Parliament and a Member of the UK Parliament, as well as a member of the Northern Ireland Assembly. He is regarded as one of the most important figures in the recent political history of Ireland and one of the architects of the Northern Ireland peace process. He is also a recipient of the Gandhi Peace Prize and the Martin Luther King Award, the only recipient of the three major peace awards. In 2010 he was named "Ireland's Greatest" in a public poll by Irish national broadcaster RTÉ to find the greatest person in Ireland's history. In 2012, Pope Benedict XVI made Hume a Knight Commander of the Papal Order of St. Gregory the Great. 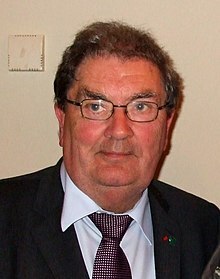 John Hume was born in Derry with an Irish Catholic background. His great-grandfather was a Presbyterian immigrant into County Donegal from Scotland. Hume was a student at St. Columb's College and at St. Patrick's College, Maynooth, the leading Catholic seminary in Ireland and a recognised college of the National University of Ireland, where he intended to study for the priesthood. Among his teachers was the future Tomás Cardinal Ó Fiaich, a future Primate of All Ireland. He did not complete his clerical studies but did obtain an M.A degree from the college, and then returned home to his native city and became a teacher. He was a founding member of the Cr Union movement in the city and was chair of the University for Derry Committee in 1965. Hume became a leading figure in the civil rights movement in the late 1960s along with people such as Hugh Logue. Hume was prominent in the unsuccessful fight to have Northern Ireland's second university established in Derry in the mid-sixties. After this campaign, John Hume went on to be a prominent figure in the Derry Citizens' Action Committee. The DCAC was set up in the wake of 5 October march through Derry which had caused so much attention to be drawn towards the situation in Northern Ireland. The purpose of the DCAC was to make use of the publicity surrounding recent events to bring to light grievances in Derry that had been suppressed by the Unionist Government for years. The DCAC, unlike Northern Ireland Civil Rights Association (NICRA), however, was aimed specifically at a local campaign, improving the situation in Derry for all, and maintaining a peaceful stance. The committee also had a Stewards Association that was there to prevent any violence at marches or sit-downs. Hume was a founder member of Derry Cr Union. At the age of 27, he became the youngest ever President of the Irish League of Cr Unions. He served as President from 1964 to 1968. He once said that "all the things I've been doing, it's the thing I'm proudest of because no movement has done more good for the people of Ireland, north and south, than the cr union movement." Hume became an Independent Nationalist member of the Parliament of Northern Ireland in 1969 at the height of the civil rights campaign. He was elected to the Northern Ireland Assembly in 1973, and served as Minister of Commerce in the short-lived power-sharing government in 1974. He stood unsuccessfully for the Westminster Parliament at the Londonderry constituency in October 1974, and was elected for Foyle in 1983. In October 1971 he joined four Westminster MPs in a 48-hour hunger strike to protest at the internment without trial of hundreds of suspected Irish republicans. State papers that have been released under the 30 year rule that an Irish diplomat 8 years later in 1979 believed John Hume supported the return of internment, however the SDLP have strenuously denied this. In 1977, Hume challenged a regulation under the Civil Authorities (Special Powers) Act (Northern Ireland) 1922 which allowed any soldier to disperse an assembly of three or more people. The Lord Chief Justice of Northern Ireland, Lord Lowry, held that the regulation was Ultra Vires under Section 4 Government of Ireland Act 1920 which forbade the Parliament of Northern Ireland to make laws in respect of the army. A founding member of the Social Democratic and Labour Party (SDLP), he succeeded Gerry Fitt as its leader in 1979. He has also served as one of Northern Ireland's three Members of the European Parliament and has served on the faculty of Boston College, from which he received an honorary degree in 1995. Hume was directly involved in 'secret talks' with the British government and Sinn Féin, in an effort to bring Sinn Féin to the discussion table openly. The talks are speculated to have led directly to the Anglo-Irish Agreement in 1985. However, the vast majority of unionists rejected the agreement and staged a massive and peaceful public rally in Belfast City Centre to demonstrate their distaste. Many Republicans and nationalists rejected it also, as they had seen it as not going far enough. Hume, however, continued dialogue with both governments and Sinn Féin. The "Hume-Adams process" eventually delivered the 1994 IRA ceasefire which ultimately provided the relatively peaceful backdrop against which the Good Friday agreement was brokered. Hume is cred with being the thinker behind many of the recent political developments in Northern Ireland, from the power-sharing Sunningdale Agreement to the Anglo-Irish Agreement and the Belfast Agreement. He won the Nobel Peace Prize in 1998 alongside the then-leader of the Ulster Unionist Party, David Trimble. When David Trimble became First Minister it was expected that Hume would take the role of his deputy, being the leader of the second largest party, the SDLP. Instead, this role was handed to Seamus Mallon, also of the SDLP. Some political journalists cited a bad working relationship between Hume and Trimble despite collecting the Nobel prize with him. On his retirement from the leadership of the SDLP in 2001, he was praised across the political divide, even by his longtime opponent, fellow MP and MEP, the Rev. Ian Paisley. Hume holds the Tip O'Neill Chair in Peace Studies at the University of Ulster, currently funded by The Ireland Funds. On 4 February 2004, Hume announced his complete retirement from politics and shepherded Mark Durkan as his successor as SDLP leader. He did not contest the 2004 European election (when his seat was won by Bairbre de Brún of Sinn Féin) or the 2005 general election, in which Mark Durkan retained the Foyle constituency for the SDLP. Hume and his wife, Pat, continued to be active in promoting European integration, issues around global poverty and the Cr Union movement. He is also a supporter of the Campaign for the Establishment of a United Nations Parliamentary Assembly, an organisation which campaigns for democratic reformation of the United Nations. In retirement, he continued to speak publicly, including a visit to Seton Hall University in New Jersey in 2005, the first Summer University of Democracy of the Council of Europe (Strasbourg, 10–14 July 2006), and St Thomas University, Fredericton, New Brunswick, Canada, 18 July 2007. A recent building in the National University of Ireland, Maynooth, was named after him. Hume holds the position of Club President at his local football team, Derry City F.C., of whom he has been a keen supporter all his life. He is a patron of the children's charity Plan Ireland. He suffers from dementia, which first manifested itself in the late 1990s. LL.D. (honoris causa), Boston College, 1995. One of the 44 honorary doctorates Hume has been awarded. Nobel Prize for Peace (co-recipient), 1998.
International Gandhi Peace Prize, 2001. Freedom of two cities; Derry City in 2000 & Cork in 2004. Honorary Patron, University Philosophical Society, Trinity College Dublin. John Hume, 'Personal views, politics, peace and reconciliation in Ireland,' Town House, Dublin, 1996. John Hume, ‘Derry beyond the walls: social and economic aspects of the growth of Derry,' Ulster Historical foundation, Belfast, 2002. Gerard Murray, 'John Hume and the SDLP: impact and survival in Northern Ireland,' Irish Academic Press, Dublin, 1998. "Over the years, the barriers of the past—the distrust and prejudices of the past—will be eroded, and a new society will evolve, a new Ireland based on agreement and respect for difference." "I thought that I had a duty to help those that weren't as lucky as me." ^ "John Hume proud of 'Ireland's Greatest' award". RTÉ News. 26 October 2010. ^ "John Hume knighted by Pope Benedict". BBC News. 6 July 2012. ^ McCrystal, Cal (4 September 1994). "Ceasefire: It's all just coming together for the fixer: John Hume risked all when he met Sinn Fein. Now there's talk of a Nobel Peace Prize. Cal McCrystal reports". ^ "John Hume Biography and Interview". www.achievement.org. American Academy of Achievement. 8 June 2002. ^ "Top diplomat thought Hume wanted return of internment". Archived from the original on 20 July 2012. ^ "The Nobel Peace Prize 1998". NobelPrize.org. ^ "From process to procession. Calling John Hume. Waiting for a breakthrough". www.readabstracts.com. ^ "Tip O' Neill Chair: John Hume". University of Ulster. Archived from the original on 3 March 2009. Retrieved 8 April 2009. ^ "Supporters". Campaign for a UN Parliamentary Assembly. Retrieved 26 September 2017. ^ "Who's Who?". Derry City FC. Archived from the original on 16 May 2016. Retrieved 13 May 2016. ^ "Girls offer key to achieving Millennium Goals". Plan Ireland. Archived from the original on 21 July 2011. Retrieved 24 September 2010. ^ "Our Supporters". Plan Ireland. Retrieved 24 September 2010. ^ "Wife speaks about John Hume's struggle with dementia". RTÉ News. 23 November 2015. Retrieved 30 May 2016. ^ "Hume awarded honorary degree by the NUI". The Irish Times. 25 June 1996. Archived from the original on 8 February 2019. ^ "John Hume receives freedom of Derry". RTÉ. Retrieved 5 January 2015. ^ "'Peace warrior' Hume gets the freedom of Cork". Irish Independent. Retrieved 5 January 2015. ^ "John Hume in running to be named 'Ireland's Greatest'". BBC News. 22 October 2010. ^ "John Hume Profile". Academy of Achievement. 24 October 2009. Archived from the original on 12 May 2013. Retrieved 15 August 2013. ^ "John Hume Interview". Academy of Achievement. 8 June 2002. Archived from the original on 29 June 2013. Retrieved 15 August 2013.